Proof that even highly rated, raved-about places aren't flawless. Exhibit A: Ikko Sushi in Costa Mesa. I hadn't been here in years, but kept reading all the foodie blogs and reviews raving about the omakase here. I finally got a chance to re-acquaint myself with Ikko, when I was introducing my San Francisco cousin and some new friends from New York to The LAB Anti-Mall and its sister center The CAMP. After a whirlwind tour of the LAB/CAMP, we had to get the New York visitors back up to LAX to catch a red-eye back east. But we still had time, and concerned about traffic AND dinner (actually in the reverse order, natch), I suggested we stay in Costa Mesa to catch a quick bite, which would allow the traffic to die down, then we'd hit the road north. 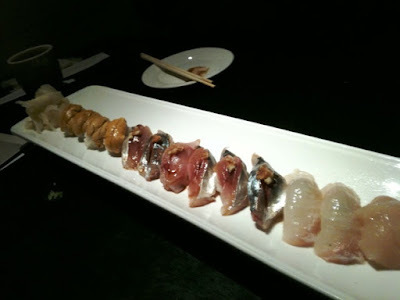 We'd been talking about this blog o' mine, so New Yorker Melissa says, "I'd love some sushi!" My cousin chimes in, "OK, Rawfishionado, is there a good place around here?" "Why yes, there are some EXCELLENT sushi spots in this neighborhood," I proudly proclaimed. And we walked the few steps to Ikko. Unfortunately, due to our time constraints, we couldn't really do a leisurely omakase. So we opted for a table that would comfortably accommodate the four of us - and our tendency to gab - and decided to simply order off the menu. 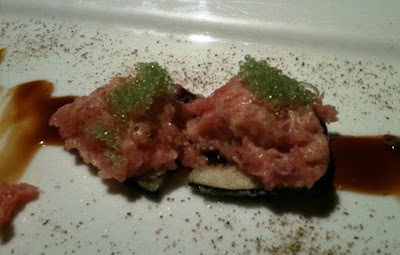 Spicy tuna on tempura-fried eggplant: tasty little morsels, topped with my favorite smelt eggs. This "carpaccio" dish has become sort of ubiquitous these days at trendy, upscale and gourmet restaurants, Japanese and non-J. But naturally, the Ikko version was superior to many I've tried, due to the high grade of fish here. The pieces melted in the mouth like buttah. By the way, the cheery waitress recommended these appetizers, which are apparently very popular. I can see why - they were delicious. But this was the first sign that I MUST return for omakase; I don't necessarily want what everyone else loves to eat - I'm ornery like that. 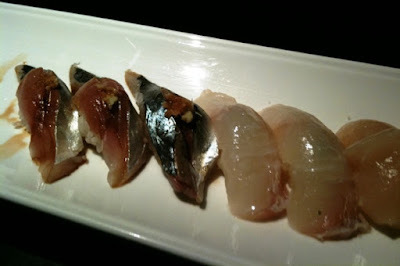 Here is a closeup of the kanpachi and albacore. 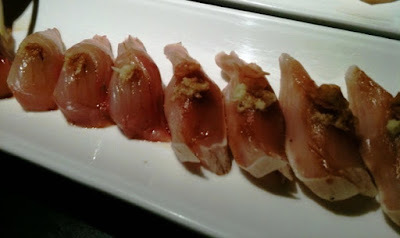 At sushi places of this caliber, I've never been disappointed with the albacore - and sure enough, Ikko's was not only super-tender and moist, it was flavored with just the right dash of ponzu-daikon sauce, with a little crispy onion on top. Albacore at lesser places often comes drowned in the sauce, which pisses me off because I can't enjoy that lovely mild flavor of the fish. 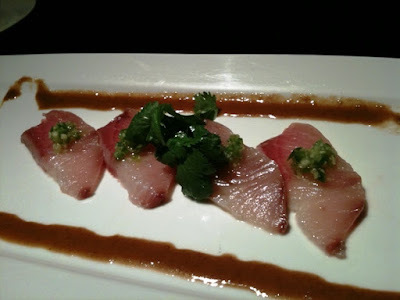 At Ikko, I was shocked and disappointed to find the kanpachi was overly sauced and flavored! If you've been reading this blog, you know of all the heavenly kanpachi I've enjoyed. Well, here, I couldn't taste the fresh, mellow, almost-sweet fish itself because the ponzu and the very strong fresh wasabi overwhelmed my taste buds. Now, I love ponzu, and really appreciate when fresh wasabi (not the powdered stuff) is served. But the kanpachi is too delicate of a fish to have such strong garnishes, and it left me wondering about the sushi chef. Maybe a junior/apprentice itamae prepared this kanpachi? To finish, Rawfishionado's version of "dessert": reliably good unagi and an incredibly yummy tamago, flecked with green seaweed. There's an art to making the perfect tamago - fluffy but firm, sweet, but only very subtly so. This one was both of those, but with an added hint of salt, thanks to the seaweed. I loved it. 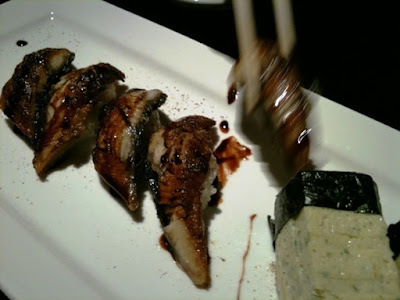 Overall, the sushi was marvelous, what you would expect at a place like Ikko. But it wasn't the best I've had, and I guess I expected better. I kept comparing the quality of Ikko's fish to the quality I consistently get across town at Shibucho - for a better price. Our Ikko sushi bill for four, with NO alcohol, came to $175; include tip, and each person paid about $50. Not outrageous, but I've been spoiled by getting sublime sushi at Shibucho for $30-$40, every time I go. So why would I return to Ikko? I do still need to give their omakase a try. Perhaps I shouldn't have expected knock-me-out sushi when I'm sitting at a table, ordering in bulk. But at this point, Shibucho remains the undisputed champion in the Rawfishionado ratings. Noodlegirl, I used to make the chao ga recipe you have on your blog all of the time, and I always love the results every time! Unfortunately, I never got around to saving it on my computer though before you closed your blog. Could you please either e-mail me the recipe, or give me access to your blog so that I can save it on my computer? Thank you, and thanks for posting the best chao ga recipe available on the internet! Sushi Saurus: Take 3 - the final chapter?